Although January is over, I still have a backlog of my #JaNEWary style challenge outfits to post. Sharing two more maxi skirt outfits. 2014 was definitely the year of the maxi skirt for me, I think 2015 will be too! The style challenge for the day was to 'wear a maxi dress or skirt'. Very easy for me! I've heard the rule that petite women shouldn't wear maxi lengths, but I've always liked them. Last year, during my pregnancy, I fell in love with them even more due to the fact that so many maxi skirts have stretchy, elastic waistbands. One of the best clothing features for during and even post-pregnancy. They featured heavily in my favourite pregnancy outfits wrap-up. I took the chance to wear this skirt and try to stretch myself a little for the challenge, and wear something I don't normally wear. I haven't worn this skirt often, it's part silk so I'm always worried about ruining it! I've had it a little over a year and only worn it three times. (Here, here and here.) Something I should stop trying to 'save' for a good occasion and just wear and enjoy! 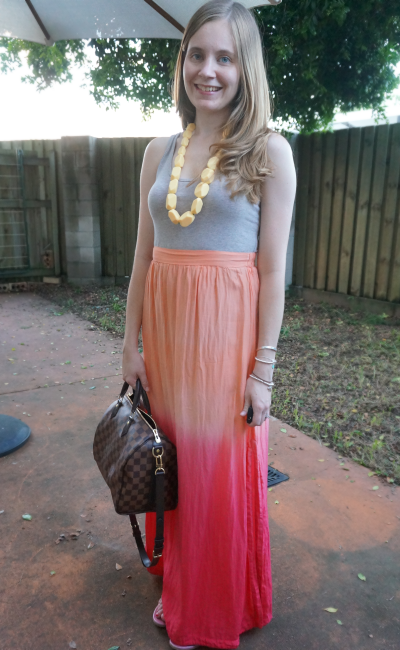 Last worn: brown tank, ombre maxi skirt, Balenciaga sandals, Louis Vuitton speedy bandouliere. The style challenge was to wear something 'green and gold'. This top fits the theme nicely, it's got a little green and gold in the floral print. Paired with the white maxi skirt, it's a rather white outfit for life with baby T...but I made it through the day without spilling anything on myself thankfully! We had our annual Australia day long weekend BBQ, and this was a really comfortable outfit for it. Baby T was a little charmer too, he's never seen so many people in our house before but he was smiling and giggling away happily. It was the first time he'd met a few people, so he did really well. I only needed the Havaianas for popping outside in the morning to setup, was barefoot inside for most of the day. This is the second time I've worn this top since I purchased it in December. I've started reviewing things I buy after wearing it twice to make sure I'm buying things I'll love and actually wear, and not adding more 'just okay' items to my overflowing wardrobe. You can read more about my goals here. So my purchase review: I'm pleased I bought this top. I know that I have too many tops after doing my wardrobe inventory, but this cami is one that I can wear with maxi skirts as well as denim, so it's perfect! A lot of my other camis are too long to wear untucked with skirts. So far I've worn it both times with a maxi skirt, but I tried it on with jeans and know it looks nice that way too. It would even be good for work (with a cardi to cover up the spaghetti straps). So even though it was an impulse 'nice to have' thing and not something I really needed, I'll still get plenty of wear out of it. Last worn: floral cami, stripe maxi skirt, Havaianas. Linking up with What I Wore, Wardrobe Wednesday, Whatcha Wearing Wednesday, Style Me Wednesday, A Labour of Fashion, Throwback Thursday, Spotlight Weekly today. I really love the ombre colors of the first skirt, it's very pretty and romantic! Love both of these outfits, especially that pretty ombre. You mixed patterns perfectly! You pull of maxi skirts so well! oh i love the ruffle cami on you! the floral looks great paired with stripes! I think the Australian Day outfit turned out great !!! and I am too making an effort on getting rid of items that don't work, but it seems like a never ending task. It is a never ending task! I'm hoping that by being more critical with what I buy, and buying less, I can make the job easier. I really want to reduce the size of my wardrobe this year. I've always told you, that you wore maxi skirts and dresses well. You carry them off nicely. Love both of these outfits on you. Love that flounce top. Mica, your hair looks so pretty! It's beautiful. Aww thank you Kim! It's at that point where I'm starting to get really frustrated with it..due a cut I think! I also don't have much white in my wardrobe, it's a good choice when you have a cute little food throwing baby around! Oh wow, both outfits are amazing Mica! The flowery top is really gorgeous!! You always look great in a maxi. That dress is lovely but I adore the mix of tropical flowers and thin stripes in that second outfit. Adorable!! Love your BBQ outfit! Stripes and florals ftw! You do maxi skirts so beautifully! I love the ombre one. If we aren't supposed to be wearing maxi skirts than I'm doing it wrong! I absolutely love mine. They're so cozy! Plus, you can wear them in the cooler months with tights or thermals like me without anyone being able to tell the difference. Yours are so pretty, you should not listen to these "rule makers"! I love that skirt! It looks amazing on you! Give it a go! You never know until you try! :) Although you might have to make good friends with your tailor...haha! Both outfits are great but I just adore the 2nd outfit. I always think you look great in maxi and never thought you should not wear them because you are petite. there's something really nice about that floral print with the black and white stripe maxi together! glad you're getting lots of wear out of the top. i think it's just the perfect length to go with everything!